Meet Mr. Bones. He's just your average, skeleton-man going about his day. He gets up in the morning, drinks his morning cup of joe, and walks out the front door to go to work. However, he works in the scaring industry, and he needs a housemate who understands his job. Many people don’t know this, but he does have a sweet side… He loves hugs! But be careful, his hugs can get a little boney! 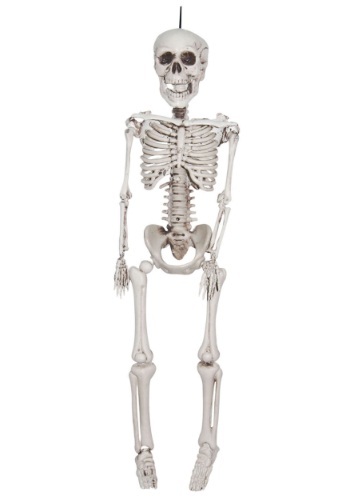 Add this 20 Inch Plastic Realistic Skeleton as a decoration in your home so Mr. Bones can finally find a home and settle down. He would make the perfect addition in any home, but he is looking for a house preferably with a basement and close proximity to a cemetery. A haunted house would be preferred, but he is willing to bring his ghost-friend along so she can haunt your house! There is one thing we do need to mention though… Whatever you do, do not mention his height, he is self-conscious about how he is only 20 inches tall. However, his compact height is perfect for displaying him every Halloween season! He has anatomically correct details and has a loop through his skull, for the easy and proper display, he is a gentleman after all. He adds a level of spooky to any room he enters, and hopes that you two will be able to live spookily ever after.